With great excitement, I announce the cover of my eco adventure, Great Barrier Reef Rescue – Song Bird 4. HUGE thanks to those who supported Song Bird 4 on its literary journey. CapriCon presents Song Bird Superhero Show on 6th April. Superheroes, super authors and super kids will descend on Rockhampton showground for the CapriCon festival. Meet fantasy author Kate Forsyth and Playschool performer Jay Laga’aia. He’s also known for his role as Captain Typho in Star Wars Episode II. Premier’s Reading Challenge feature my Books!!! I’m honoured three of my children’s books are listed on 2019 Premier’s Reading Challenge for kids to read. I can’t believe it! 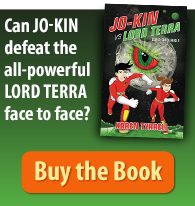 … Thousands of children will be reading my books in schools and at home. So far, this is my 4th piece of thrilling news for this month! Childrens Book Council of Australia highly recommends my book, Song Bird Rainforest Rescue. Childrens Book Council of Australia reviewed Rainforest Rescue in their Reading Time magazine. They gave Rainforest Rescue a highly recommended rating. Celebrate Chinese New Year with Ready Set Discover Logan Pantomime, starring Chung Tian Temple. Logan award-winning author Karen Tyrrell & hubby Steve perform a FUN children’s book, storytelling about the BEST places to visit in Logan. YIPEE! 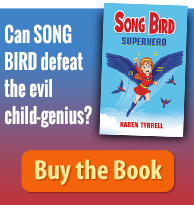 Last week I, Karen Tyrrell zoomed superhero adventure, Song Bird #4 to a professional editor. Exhilarated, I rode a wave of excitement. On Sunday, I hiked Palm Grove at Mt Tamborine National Park to boost my self-care, breathing in fresh ionized air. To prepare for an enormous writing week ahead! Kick Start 2019 with Write & Publish a Children’s Book. 2019 is YOUR year to dream BIG and make your children’s book happen. 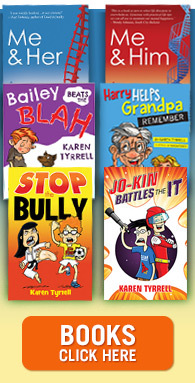 I, Karen Tyrrell Author, will guide you on how to Write, Plan, Pitch & PUBLISH a children’s book. 2019 Make it Your Year … 2019 is going to be MY year too! I’m setting Achievable Goals for 2019, Guaranteed for success! Join the Christmas FUN as author Karen Tyrrell transforms her Song Bird Superhero character into Song Bird Christmas angel. Co-author, Steve Tyrrell transforms his Tree Man character into Christmas Tree Man. Both will wear Merry Christmas costumes, jingling all the way!